Blood pressure - Beetroot lowers the blood pressure temporarily. 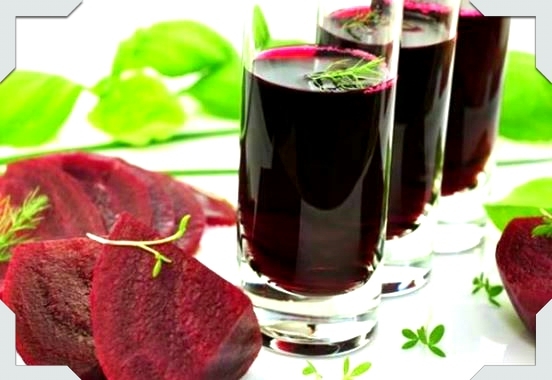 The effect from the beetroot lasts approximately 24 hours. So you have to take it every day if you want to permanently lower the pressure. It is effective because it contains nitrates, which can stimulate the production of nitric oxide and are responsible for the expansion of blood vessels in the body. The blood circulation improves and the blood pressure lowers when the blood vessels expand. Otherwise, nitrates which are used in the industry for keeping the freshness of the product are considered as unhealthy, but the nitrates that are found naturally in vegetables do not have any bad influence on the body. Beetroot increases physical endurance - One study from St. Louis University in the US has shown that consuming beetroot can improve athletic performance. Two groups of people who have ran 5 kilometers were observed. The first group ate 200 grams of beetroot before running, while the other group drank cranberry juice with the equal number of calories. The people in the group who chose the beetroot, were running 5% faster. Another study from the Universities has shows that the cyclists who consumed beetroot juice before workout could drive 20% longer. This effect is also caused by nitrates from the beetroot, which dilate blood vessels and results in better athletic performance. Beetroot , carrots and apple are washed and cut into small pieces. Place them in a blender. In it you can add lemon or orange juice and one tablespoon of honey. This drink should be taken fresh (do not preserve for other days) every day until you blood count improves. I can guarantee you that this improves blood counts.